Mission Ventura was the ninth one built in California, founded March 31, 1782, by Father Junipero Serra. The name Mission Sam Buenaventura is in honor of Saint Bonaventure. 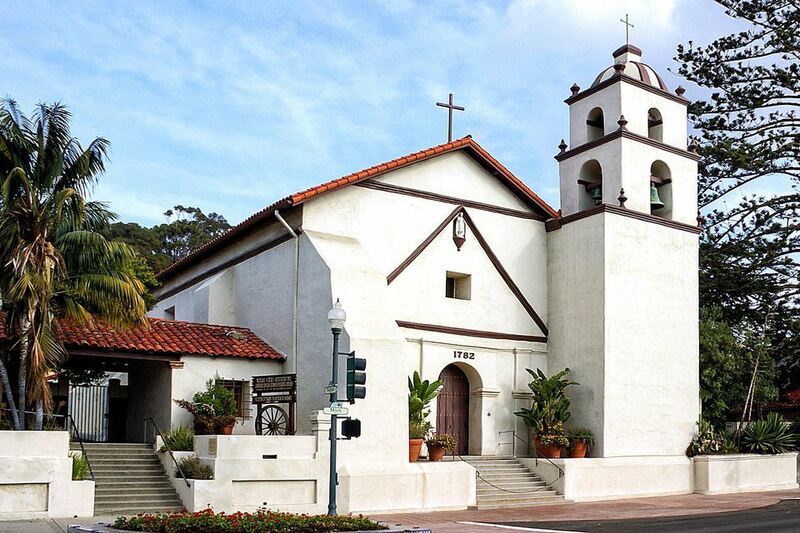 Mission San Buenaventura was the sixth and last mission personally dedicated by Father Serra. Mission San Buenaventura was never destroyed. Mission San Buenaventura, 211 E. Main Street, Ventura, CA. 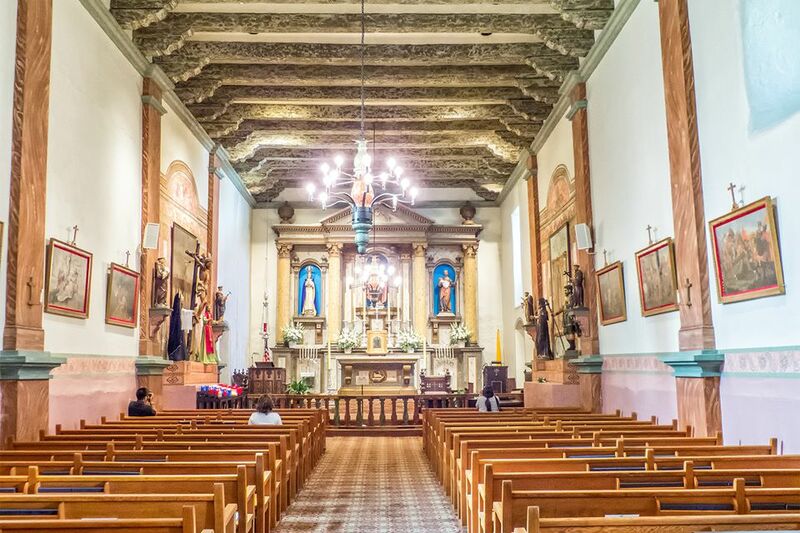 Mission San Buenaventura is located on Main Street in downtown Ventura, north of Los Angeles. From US 101 south, take the Ventura Avenue exit. Turn right on E. Main Street. From US 101 North, take the California exit. Turn right onto California Avenue, and then left onto E. Main Street. Parking is available on Main Street in front of Mission San Buenaventura, or turn left onto Palm and left again into the parking lot area next door. San Buenaventura Mission was founded on Easter Sunday, March 31, 1782, by Father Junipero Serra, who was assisted by Father Pedro Benito Cambon. The service took place on the beach of the Santa Barbara Channel, in the same place Juan Rodriguez Cabrillo had claimed California for Spain in 1732. San Buenaventura Mission was originally planned to be California's third mission, located halfway between San Diego and Carmel. Father Serra couldn't get military protection from Spanish Governor de Neve, and by the time it was built, San Buenaventura Missions was the ninth mission instead. Governor de Neve was following orders from the King of Spain, who thought it was easier to secure California by giving it to settlers than by building missions. Father Serra had a hard time convincing de Neve to let him build more. Finally, they met and agreed to build two new ones, San Buenaventura Mission and Santa Barbara. Father Serra left Father Cambon in charge, and San Buenaventura Mission began to grow and flourish. The local Chumash Indians, who the Spanish called Channel Indians, were smart, energetic, and willing to work for payment in beads or clothing. With their help, the first buildings at San Buenaventura Mission went up quickly. The first church burned down in 1792, and it was replaced by a new one that was started in 1795 and finished in 1809. With the Indians' help, the Fathers built a seven-mile-long aqueduct that watered orchards and gardens so extensive that explorer George Vancouver, who visited San Buenaventura Mission in 1793, said they were the finest he had ever seen. The missionaries were driven from their church twice in the early 1800s. In 1812, an earthquake and tidal wave drove everyone inland for about three months. In 1818, the French pirate Bouchard was raiding along the coast, and the Fathers and Indians took valuable objects and fled into the hills, staying there for almost a month. Fortunately, the pirate was stopped at Santa Barbara and never reached the mission. In 1819, the San Buenaventura Mission guard tried to keep a visiting group of Mojave Indians from socializing with the local Indians. The confrontation turned violent, and the Mojaves and two soldiers were killed. By 1816, San Buenaventura Mission was at its peak, with 1,328 Indians living there. The first administrator after secularization, Rafael Gonzales, made the process more gradual than it was elsewhere. 1845, he rented the San Buenaventura Mission buildings to Don Jose Arnaz and Narciso Botello, but later Governor Pio Pico illegally sold them to Arnaz. After California became a state, Bishop Joseph Alemany asked the United States government to return the San Buenaventura Mission buildings, orchard, cemetery and vineyard to the church, which Abraham Lincoln did in 1862. Ventura began to grow when the railroad arrived in 1887, and San Buenaventura Mission found itself surrounded by the growing town. It was never abandoned and the buildings stayed standing. San Buenaventura Mission was restored in 1957, and it is used today as a parish church. Three Fathers are buried in the church: Father Vincente de Maria, Father Jose Senan, and Father Francisco Suner. Mission San Buenaventura's first building was destroyed by fire in 1794, and builders abandoned the second church when its door gave way, but by 1792, the present church and the other buildings that surround its quadrangle were being built. Today's stone masonry church was half completed by 1795, but it took until 1809 to finish it, and it was dedicated on September 9, 1809. Mission San Buenaventura's walls are six and a half feet thick. Its main altar and reredos came from Mexico in 1809, and the original hand cut pine and oak ceiling beams hauled from the mountains and dragged down the coast with oxen still support the roof. In 1812, an earthquake struck Mission San Buenaventura. Its bell tower collapsed, and the buildings were not fit to live in for a few months. Unlike many other missions that fell into ruins after secularization, San Buenaventura was well cared for, and it still has its original walls and floors. Another earthquake in 1857 damaged the mission, and its tile roof was replaced with shingles. A few years later, a well-meaning priest named Father Cyprian Rubio "modernized" inside, covering the original floor and ceiling, removing the hand-carved pulpit and replacing the small windows with stained glass. The two Norfolk Island pines in the church garden are said to be more than 100 years old, planted by a sailing captain who wanted to grow wood for ship's masts. The photo above shows its cattle brand. It was drawn from samples on display at Mission San Francisco Solano and Mission San Antonio. It's one of several mission brands that include the letter "A" in various forms, but we have not been able to find out its origin. In the center is Saint Bonaventure, for whom the mission is named. On the left is Mary, and on the right Joseph holding the baby Jesus. This altar is on the wall to the left of the main one. In the center is the Shrine of Nuestra Senora de Guadalupe, painted in 1747 by Francisco Cabrero. On the left is St. Gertrude and on the right St. Isidore. According to information in the museum, Mission San Buenaventura was the only one that had wooden bells. The bells in the tower are now made of metal. This wheel was used to grind grain into flour.